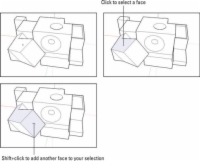 If you want to move (rotate, copy, and so on) something in your SketchUp model, you need to select it first. 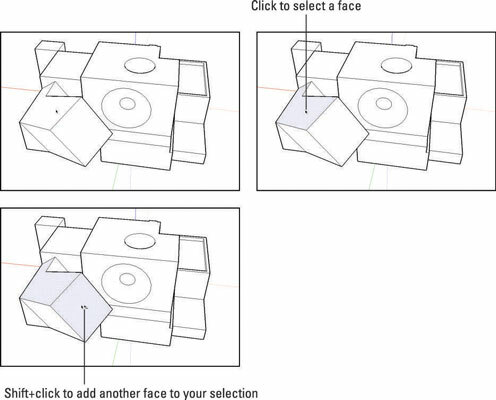 When you make a selection, you’re telling SketchUp that this is the stuff you want to work with. 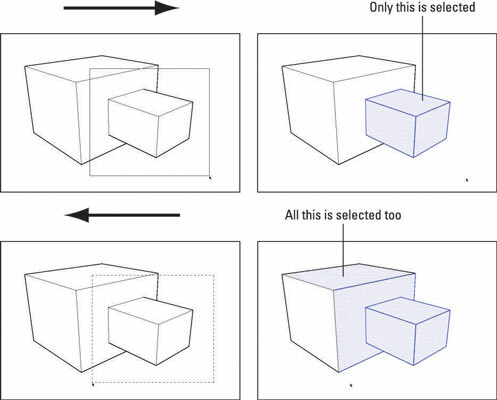 To select things, you use (drum roll, please) the Select tool, which looks exactly the same as the Select tool in every other graphics program on the planet — it’s an arrow. 1Technically, every single thing you see in your modeling window is an entity. Elements are basic pieces of geometry like edges and faces. Objects are made up of elements. Components and groups are objects. Anytime you want to make a separate thing with its own name and metadata, you make an object. In SketchUp, they’re everywhere. Annotations are things like text, guides, dimensions, and section planes. It’s kind of a catch-all category — anything that isn’t an element or an object is an annotation. 2Just click anything in your model to select it (while you’re using the Select tool, of course). To select more than one thing, hold down the Shift key while you click all the things you want to select. The Shift key works both ways when it comes to the Select tool. You can use it to add to your set of selected things, but you can also use it to subtract something from your selection. In other words, if you have a bunch of stuff selected and you want to deselect something in particular, just hold down Shift while you click it — it isn’t selected anymore. 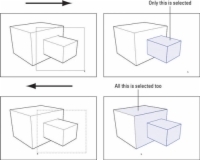 3Selected entities in SketchUp look different depending on what they are. Selected faces look covered in tiny blue dots. Selected groups and components have a blue box around them. 4A much fancier way to select things in your model is to double- and triple-click them. When you double-click a face, you select that face and all the edges that define it. Double-clicking an edge gives you that edge plus all the faces that are connected to it. When you triple-click an edge or a face, you select the whole conglomeration that it’s a part of. 5You can also select several things at once by dragging a box around them. You have two kinds of selection boxes; the one you use depends on what you’re trying to select. Window selection: If you click and drag from left to right to make a selection box, you create a window selection. In this case, only things that are entirely inside your selection box are selected. Crossing selection: If you click and drag from right to left to make a selection box, you create a crossing selection. With one of these, anything your selection box touches (including what’s inside) is selected. You can make selections turn any color you want. Blue is just the default color for new documents you create. The selected things color is one of the settings you can adjust in the Styles dialog box. Just because you can’t see something doesn’t mean it isn’t selected. Whenever you make a selection, it’s a very good idea to orbit around to make sure you have only what you intended to get. Accidentally selecting too much is an easy mistake to make.